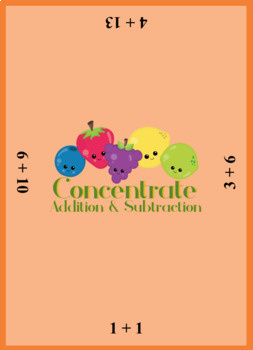 Concentrate bring together the classic card game of Memory/Concentration and math to create a new type of learning experience! Like Memory, students will have to take turns picking two cards and flipping them over to see if the designs match. Each card also has 4 math problems on its sides, and students must solve whichever one is facing them to be able to turn it over. If the students do not find a match, they are allowed to place them anywhere on the table and in different orientations so that they pick which problems opponents have to solve. 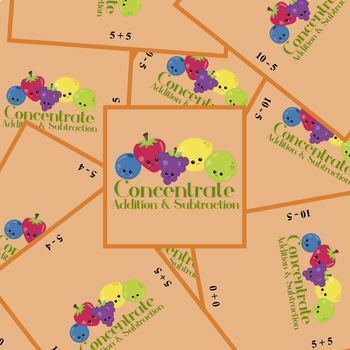 With these rules, students not only practice their own addition, subtraction, and memory skills, but also encourage other students to tackle harder problems. The ideal grade for this is 1st grade, but it may help advanced K-students or 2nd grade students who need help with regrouping. Fruit graphics are made by Prettygrafik at https://www.etsy.com/shop/Prettygrafikdesign. Please view the preview and ask about any questions or concerns!